I've been expanding my practical baking horizons, trying out different breads and other goodies. 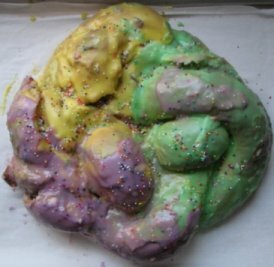 Two recent successes were Mozzarella Egg Bread and a homemade King Cake around Mardi Gras (recipe courtesy of Food Network). The cake didn't look nearly as pretty as ones in stores. But it was a blast to make - twisting the dough, hiding a jordan almond (since I was sans the usual tiny, plastic babies), mixing the icing. And, best of all, it tasted delicious. 1. Combine 2 cups flour, yeast, sugar and salt in a mixing bowl. 2. Stir eggs, yogurt, 1.5 cups cheese ( I used 2) and water into flour mixture; beat until smooth – about 3 minutes on high speed of electric mixer. 4. Turn dough onto floured surface; knead until smooth and elastic (5 to 8 minutes). 5. Place in an oiled bowl; turn to oil top of dough. Cover, let rise in a warm place until double in bulk (about 1 hour). 6. Punch dough down. Divide in half; shape into loaves and place in 2 greased 9x5x3 loaf pans. Cover; let rise until double (about 30 minutes). 7. Top loaves with remained cheese (.5 cup). 8. Bake at 375° F for 30 minutes or until done.